As with most ideas, this one also took shape out of necessity to reduce manual work and dependencies in various scenarios. This blog post shows one of the many ways to read SMS messages from a jailbroken iPhone and send it as an email. There are ways to do this using a few Cydia Apps but they usually require you to register for an account or pay for the service which was less than ideal for me. The sms.db-wal is a "Write Ahead Log" which is responsible for transactional behavior, while the sms.db-shm is an "Associate File" which is required to read sms.db-wal and the original sms.db. 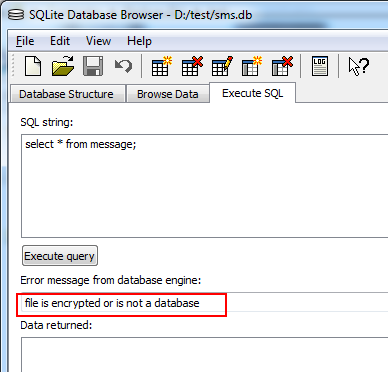 sms.db is the main file that retains most data, however these files are temporary in nature. The last received SMS message will go into sms.db-wal file. sms.db-wal uses a different format on top of the standard sqlite structure as the sms.db. All three files are read with a single connect() function call from the sqlite API. First task at hand is to read sms.db file and analyze the database to find out how iOS is storing SMS messages. For whatever reason many of the sqlite3 utilities seem to have problems opening the file. 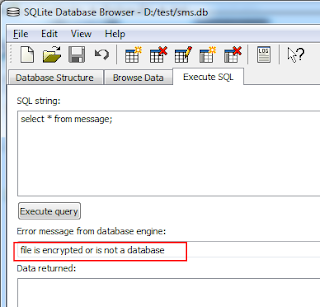 Although the initial import worked using sqlite3.exe on Windows, attempts to query the sms.db file failed. I also tried SQLite Database Browser which resulted in the below error. With a potential idea of where SMS messages might be stored, I decided to use Python’s sqlite API to query the database directly. What’s interesting to note is that the sms.db contains even very old messages that aren’t displayed on the device. This is because sms.db-wal retains the latest state for the device’s UI - so only a subset of messages are shown. smsCreateTrigger.py will create the database trigger and the message2 table. You’ll only need to run this once to get the database set up. I’d recommend backing up your sms.db just in case and if you get any errors thoroughly inspect them. If you have any problems you can uncomment the DROP statements (and comment the CREATE) to clean up the sms.db. smsWatcher.py should be run in the background and will poll the message2 table for new entries. Once it sees one, it’ll take the message and send out an email via SMTP. You’ll need to manually set the following variables within the script to the variables applicable to your setup. Note that we’re only forwarding messages from a specific address. If you’d like to forward all messages simply modify the SELECT statement to not use the address field. There is already an app from www.bosspy.com that does this for free, it can also recover safari url, gps data etc and either email or you can log on to their website and download and print results.